How many of you guys like Asian cinema? I have for quite a long time, I love how hyperactive their cinema is. That is the best way to describe “Tokyo Vampire Hotel” it is hyperactive. Everything about the movie you could attribute as hyper. The film is hyper stylized, it is hyper exaggerated, it is hyper violent. This is a movie that is pumped with steroids. This is a movie that has its volume turned all the way up, disturbing your neighbors. “Tokyo Vampire Hotel” is exactly what it sounds like. There is a group of vampires called the Corvins, who spread their influence all over the globe, including Japan. They have also been running a hotel for hundreds and hundreds of years, where they lure unsuspecting humans to their hotel, capture them, and use them as a blood farm. An ongoing, continuing food source which would sustain them for the unforeseeable future. The film focuses on Manami, who eventually meets a girl named K. K belongs to a different, rival group of vampires called the Dracula’s, and yes they are really called the Dracula’s. The Dracula’s were the first group of vampires to form and they are at odds with the Corvins. Both the Corvins and the Dracula’s want Manami, because she’s a special vampire that was born in 1999 at 9:09 PM. When Manami sinks her teeth into a someone, she gains their power, making a huge player in the war between the Corvins and the Dracula’s. Both sides want her for their own purposes, all the while all the human guests at the hotel are banning together to kill their way out of the hotel, all the while the world is ending outside. I think if “Tokyo Vampire Hotel” chose to either focus on Manami’s story, or the story of the humans trying to survive the hotel, the movie would have been much stronger overall. As it sits though, the movie bites off more than it can chew. We get to Manami, we get to know the humans in the hotel, we get to know the villains, we get to know K and she has a subplot with a romance. It’s all interesting, but it all feel like unnecessary filler. This is a movie that runs two hours and twenty-two minutes, and it feels like the movie drastically needed an editor at times. There are also times when the movie feels like its lagging a bit too much. It’s like the filmmakers had two stories they wanted to tell, but simply ran out of story to tell, and there is definitely a feeling of “more of the same” by the time the credits roll. But if its bloody violence you want in a vampire movie, its bloody violence you are going to get. There are some funny gags staged throughout the movie that made me laugh. There is a huge fight scene at the end of the movie, and there was a humorous nod to Brian De Palma’s “Scarface” that made me laugh over and over again. There are some funny moments where the movie uses familiar scores to punctuate scenes and themes. That also put a huge smile on my face. In speaking of music, the film’s score is simple, yet shockingly affective. It’s mainly a base beat with a rhythmic percussion movement. It’s not the most extravagant score I have heard in my whole life loving movies, but I found myself nodding my head and tapping my foot. While I don’t think the movie works as a whole, there is so much fun to be had with “Tokyo Vampire Hotel” that I couldn’t help but like it. I think there is plenty here that is recommendable for audiences to enjoy. 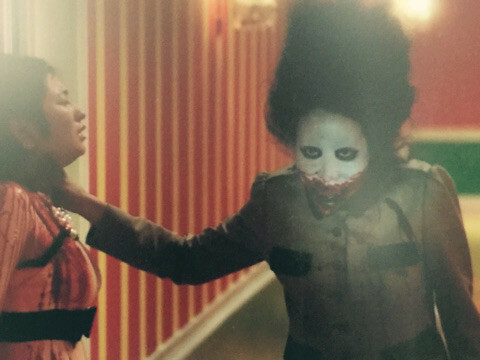 If you enjoy the bloody goodness that Asian cinema has to offer, “Tokyo Vampire Hotel” will fit the bill perfectly.